After two and a half great weeks at Lake George we are back on board and slowly heading north to Washington DC. We expect to pull into the Capital Yacht Club on August 8 and will spend 10 days there in a slip. 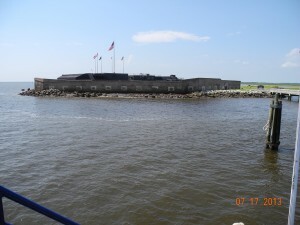 Before leaving Charleston I took time to visit Fort Sumter which is located smack in the middle of the Charleston Harbor. 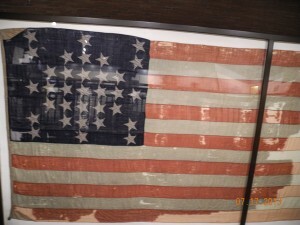 On April 12, 1861 Confederate artillery opened fire on the fort. 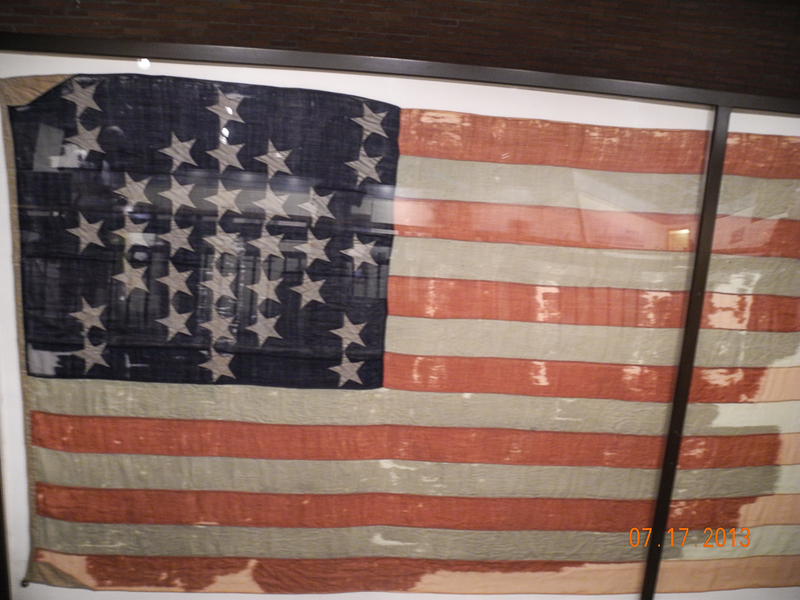 Fort Sumter surrendered 34 hours later. The Civil War had started. There is very little left of the original fort but the museum and overall experience is worth the effort. 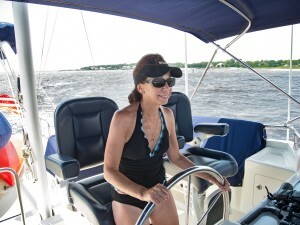 Left Charleston Harbor Marina around 9AM on July 18 and headed down the Cooper River. 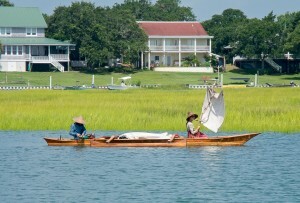 Picked up the ICW south of Charleston and turned north. 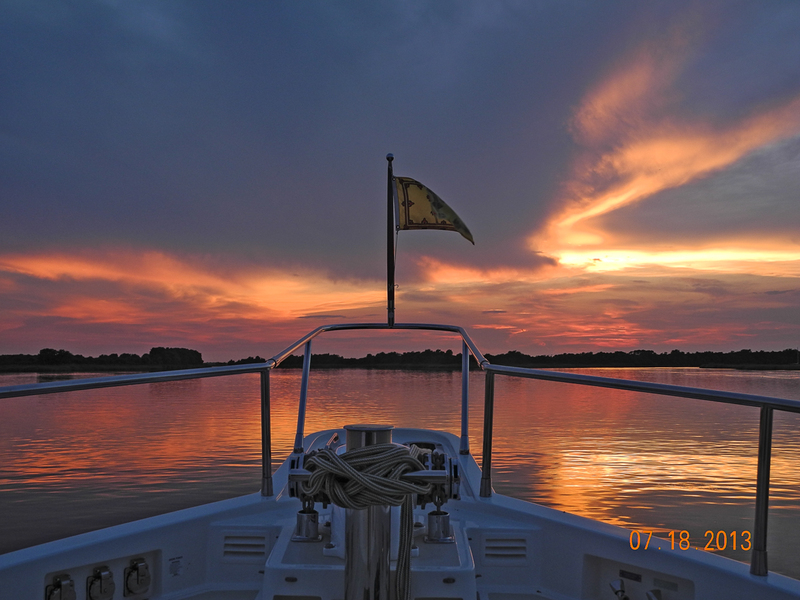 Six hours later after an uneventful cruise thru the South Carolina low country we dropped anchor in Minim Creek. Weighed Anchor and continued north for a lunch stop at Georgetown SC. 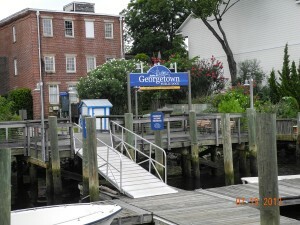 There are two town docks that provide free daytime tie ups and we were able to find a completely free one to side tie. 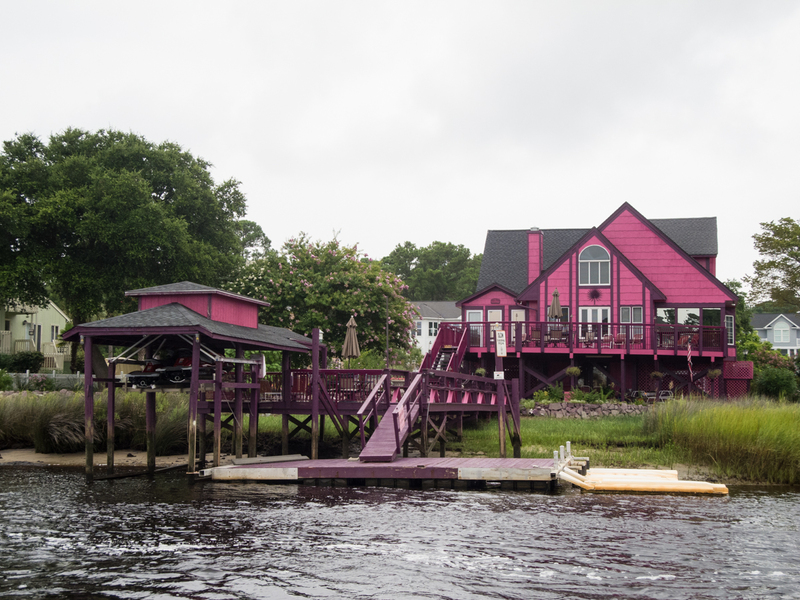 Georgetown is an old village near the mouth of the Waccamaw River. They revived and rebuilt their waterfront and now it’s a destination by both car and boat. 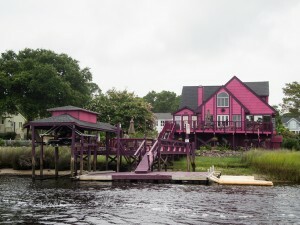 Many restaurants line the shore and a youth sailing school operates off the waterfront. We met a retired wife of an International Paper Executive and she recommended the “Big Tuna” raw bar for lunch. Perfect…. Also found Kudzu Bakery which sold frozen soups, shrimp and grits and many other southern delights. 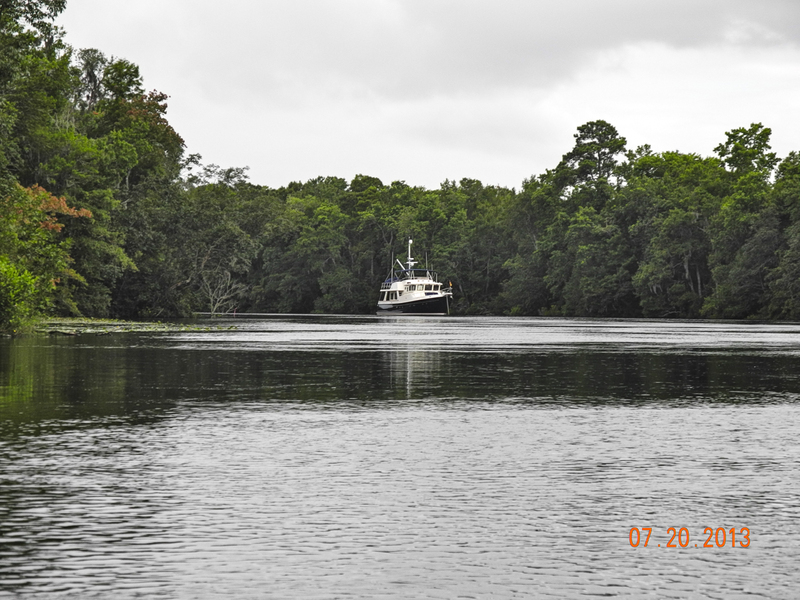 Pulled out of Georgetown and continued up the Waccamaw River. 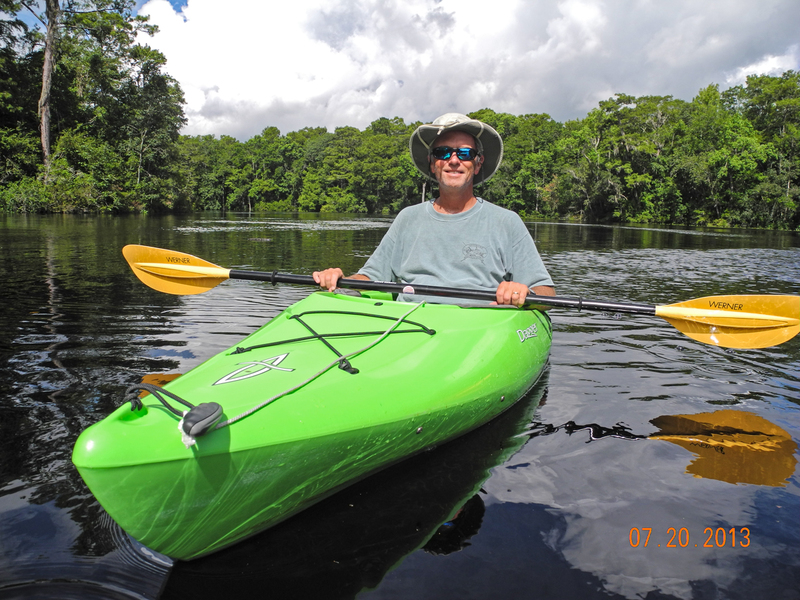 Like much of the coastal water in South Carolina the Waccamaw River is a golden brown or tea color. This is due to tannins and other pigments that have leached out of vegetation growing in the extensive wetlands adjoining the river. 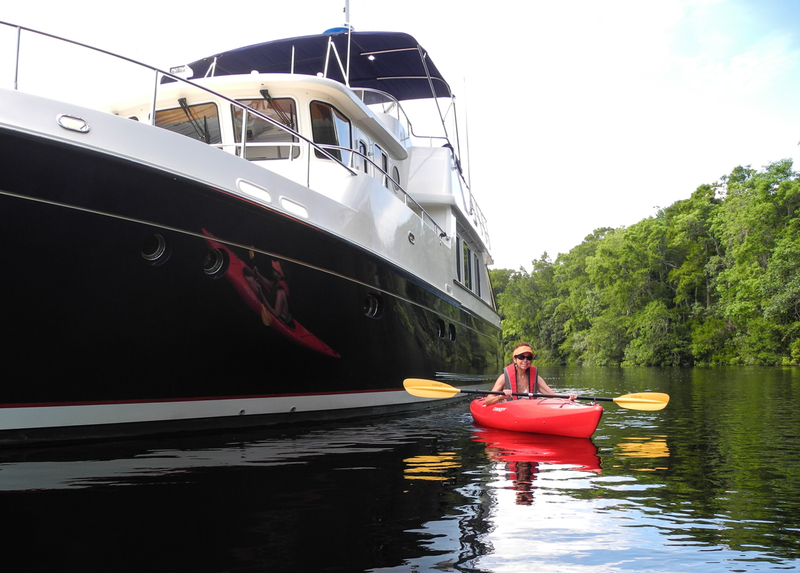 The Intracoastal Waterway joins the Waccamaw near Bucksport and shares the river channel for over 25 miles to Winyah Bay and Georgetown. Despite the uninviting color of the water we loved the Waccamaw River. It was very peaceful and provided several hours of beautiful scenery. 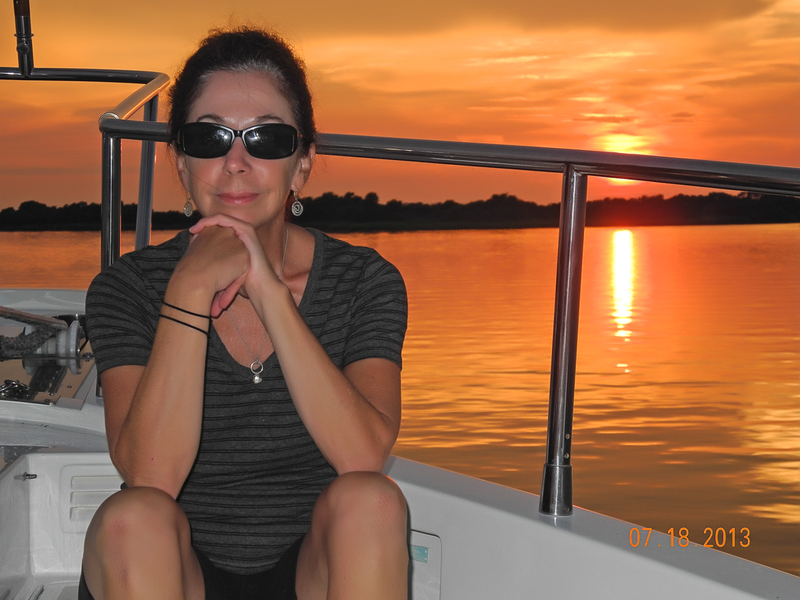 We spent two nights off the Waccamaw on Prince Creek. 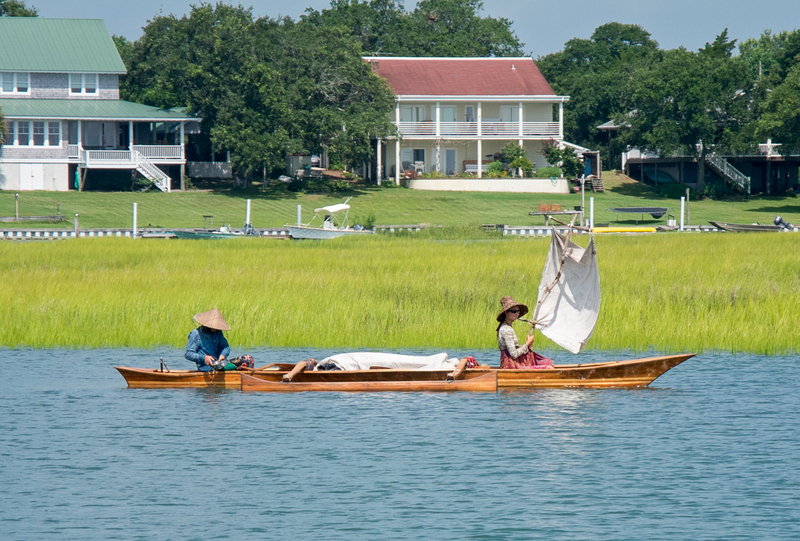 Prince Creek is roughly two miles of winding, narrow, tree lined waterway. it is deep along its length. We anchored in the center of the creek in 20 feet of water. The slow flow of the river held us in the middle. It was a perfect creek for kayaking. We saw an alligator for the first time. It was resting in the water on the edge of the creek. Its eyes and head barely above the waterline. As we approached it slowly lowered and disappeared. 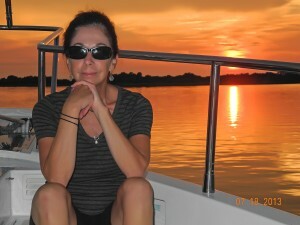 We also heard an alligator attack and kill a meal no more than 100 feet from our anchorage. On to Myrtle Beach. Five miles north of Prince Creek we left the Waccamaw and spent the next several hours slogging thru the ICW and along some ugly built up waterway behind Myrtle Beach. It was essentially a ditch cut and blasted to create this portion of the ICW. Homes and developments lined the shores. 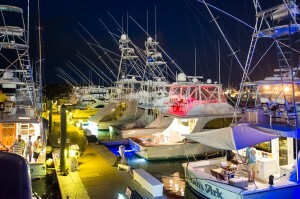 Spent two nights at the Myrtle Beach Yacht Club. Great place with nice pool. Rented a car for a day to explore Myrtle Beach. 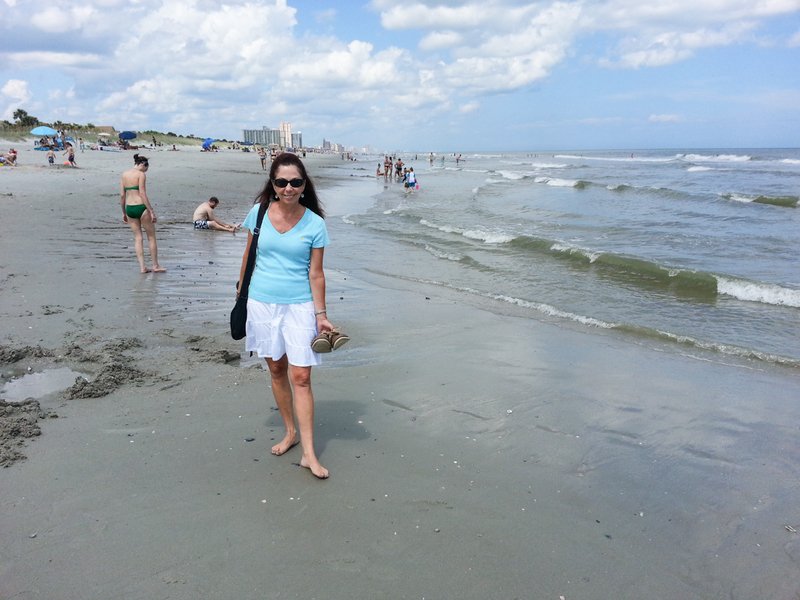 Mytle Beach to Carolina Beach was a long seven hour ride but was much more scenic. 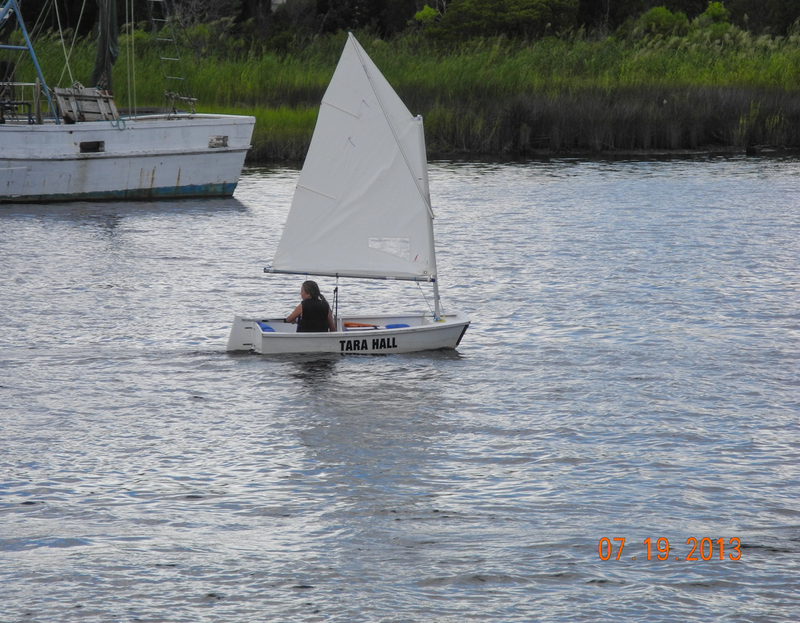 After a few hours of ICW you exit the canal portion and enter the Cape Fear River. There was an outgoing tide confronting an East wind creating short steep seas for five of the nine miles you are on the River. Carolina to Mile Hammock Bay was also an interesting and scenic cruise. 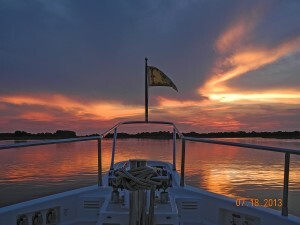 Mile Hammock and the property around it is owned by the Federal Government and controlled by the Marine Corps. 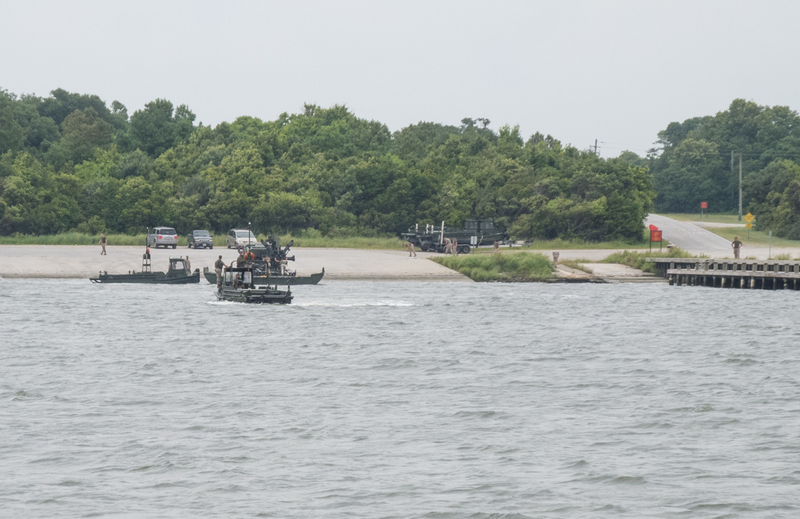 Camp Lejeune covers 246 square miles and has 14 miles of beaches. Construction of the camp started in 1941 and it has served the USMC since then as a major amphibious assault training facility. It houses expeditionary forces and special ops. 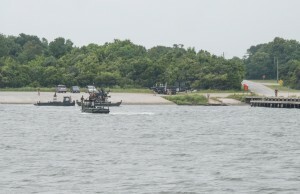 While we were anchored for the night amphibious training was taking place. It was an easy 36 miles from Mile Hammock to Morehead City. Morehead is industrial and a bit gritty but the Yacht Basin was very nice. Just don’t look to the north as a large Potash plant obscures the view. A major sport fishing tournament was about to happen over the weekend and many sport fish were docked around us.